VeChain is a project with at its centre a blockchain powered by 101 VeChain Authority Masternodes, it is managed by the VeChain Foundation, which is a non-profit based in Singapore. VeChain does have a focus on regulation and on enterprise level applications which use its blockchain, it has registered many partnerships with global companies such as BYD, BMW, DNV GL and PWC amongst many others. VeChain is one of the blockchain projects which has executed this partnership strategy elegantly. The more companies join the more other companies will be interested in joining. The utility of VeChain is to digitize real-world assets and track them this deters counterfeiters and keeps a log of the provenance and the way the goods were handheld (such as temperature) it also allows for digital assets to be commoditized, for example, vehicle and traffic data. VeChain did undergo a token swap, the old was called VEN while the new one is called VET. Each VeChain generates 0.000432 of Vthor. This factor can go up but cannot go down. VeChain foundation has a pool 150 billion VET, all vThor generated from this pool will be divided between all those who stake. This pool will decrease by 25 billion VET every 6 months, until further notice. It is unclear if this pool is set up as x nodes or not. X-nodes will earn reward 1 on top of reward 1, X nodes needed to fulfil a number of strict criteria, the details are irrelevant because no one can join this program at this time. Reward 2; The VeChain foundation has reserved 50 billion VET the vThor generated from this pool is divided among the x-nodes. The Thor Power generated by this pool will be divided amongst those The VeChain foundation is not bound by any contractual agreements and can change this of their own accord. VeChain masternodes (Except Authrothiy nodes) stake and do not require a VPN as in the typical masternodes. In order to stake Economic and x-node masternodes need only have their coins in a wallet which can be offline. The emission rate of VThor for the staked VET, the economic nodes the x-nodes and any new programs initiated by the VeChain foundation in the future. The type of investor owning the nodes is it passive income investors those focused on just flipping the coin or VeChain users? TheVeChain users want to hold VThor for their use while the passive income investors want to sell. The VeChain foundation might modify the size of the pools, create new incentives, create new types of nodes in order to either attract new investor of pay back the loyal ones. At the time of writing, all nodes earn less than 5%. Economic nodes will have their returns decreases every six months because the VET pool of 150 billion VET will decrease by 25 million every six months. The x node program was introduced after the economic nodes and in a way, this changed the rules of the game at halftime. IThe X node program did take away benefits from the economic nodes, ultimately the vThor that 50 billion VET pool could have been allocated to the Economic node pool. This to me individuates that the foundation is willing to sacrifice the interests of old fans to get new ones to the projects. The VeChain foundation did this again when they introduced a lower tier of xNodes of 600,000 VET which allowed more fans/investors to start climbing the veChain ladder. What this meant is that they opened the door for more x-nodes which made the returns for the 50 billion pool smaller to the passive income investor. 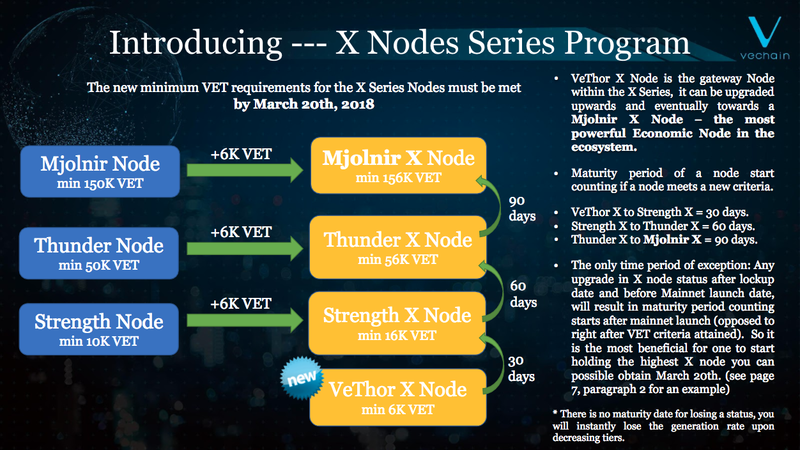 X nodes will have their returns decreases every six months because the VET pool of 150 billion VET will decrease by 25 million every six months, however, the 50 billion VET pool will not decrease. If the amount of VET decreases below a certain threshold then the X node status is lost. There are arguments in the VeChain community and elsewhere about the true nature of the X node program itself. Was it created to reward those loyal true fans of the project? Or Was it created to build hype, FOMO and create lock-in and investor inertia? IMHO, it shows that the foundation is ready to create incentives to attract more investors, it is pro-active, The community needs to give feedback if the balance between attracting new investors and taking away from old ones becomes too punitive. There can be no more x nodes created and there is a high possibility that some x node holders will drop out this will increase the returns of the remaining x node holders. X nodes can participate in ICOs and have other benefits, still to be announced by the VeChain foundation. VeChain is not a typical masternode project because it has to make important partnerships and also have their own blockchain which has unique advantages. Most other masternode projects are just a fork of Dash. Probably there is less risk investing in VeChain than in some altcoin cloned from Dash. The VeThor reward can be changed by the foundation. The foundation’s objective is to increase adoption and this is dependent partially on the cost of transactions, their interest is to keep the price of VeThor down. The hope that demand for VeThor comes from big partners might be misplaced because some of these will get an authority node and these type of VeChain masternodes will generate a lot of VeThor, reducing demand from these big players for Vethor on the open market. The hope is that as the rewards for the economic and x-node decrease, either the VThor base emissions rate increases or the vThor price does. If this does not happen some x nodes and economic nodes may start abandoning the VeChain ecosystem, especially those who own a VeChain masternode for passive income. This might balance things out and stabilise the VET to new price levels because as some investors leave others may join. VeChain foundation has created a lot of FOMO when they announced the X node program. FOMO is part of most marketing strategies that is no secret. The x-node program was not straightforward to understand because of all the timelines and the different types of nodes. In a Fomo state investor make emotional decisions and do not fully consider the risk-reward ratio. VeChain is one fish in the pond, it is a big fish but there are others like her. FOMO can be fought with research #DYOR, but the crypto markets are notoriously difficult to research, this makes finding a likely winner, relaxing because it allows one to settle down rather than keep researching. There is another factor influencing the VeChain price; investor inertia. That means that the investors invested in this project months ago do not continually check the pros and cons of accordingly and invest or divest if their perception has changed. Probably the passive income from the masternodes deters some people from selling. VeChain has 58.7k of subscribers, Walton Chain a competitor, has only 20 k Subscribers. This show to some extent the tunnel vision in the cryptoverse whereby some investors are not willingly taking an active role to monitor the competition. Some investors turn into fans, unfortunately, fans get emotional ROI and not financial ROI! Investors bought VeChain masternodes without knowing what the returns will be. That is a fact because it was impossible to predict the VThor price. The decision was based on the partnership announcement and a little bit of hopium. Partnerships need to turn into actual use of the VeChain blockchain. Still today most of these partnerships are not implemented, VeChain is probably one of the best-placed projects to offer their blockchain as a service to global corporations. The relatively low ROI from the VeChain masternodes at this time has hit hard those who joined the masternode program purely for passive income rather than capital gains. There is an important opportunity cost, for the capital held in VeChain masternodes as there are many more masternode projects and staking opportunities out there. VeChain passive income investors have the option of waiting and monitoring the project quitting. The structure of these decisions need to be decided beforehand, This is the best immunisation against FOMO. For example, one can decide if this investment is viable or not based on the passive income returns. If these returns go below a certain threshold for x weeks or months, then the investor would switch to a more viable passive income investment. On the competition front VeChain there are many competing projects; Ethereum and EOS are similar platforms on which sub-tokens can be launched. In terms of item tracking, there is Walton Chain, HyperLedger, Investments are all about perceived risk and reward ratios and for VeChain the perceived risk is lower and the perceive returns are higher. VeChain is controlled by the VeChain foundation, unlike other projects which are much more decentralised such as Bitcoin and Dash. This has its advantages because it makes the buck stop somewhere with someone, initiatives can be better coordinated and end users have a one-stop shop to get set up. VeChain is not being set up to challenge the worlds central banks so this setup gives it much more advantages. VeChain the next Microsoft or the next MySpace? At this time it seems to be walking in the footsteps of Microsoft! It will be years before we know the ultimate outcome. There are many, many lessons in this story that the crypto passive income investor can learn from!